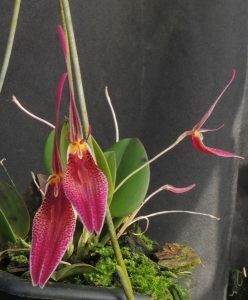 Every day is Restrepia day at the orchid project as these small growing species flower frequently and are always a point of interest for visitors. 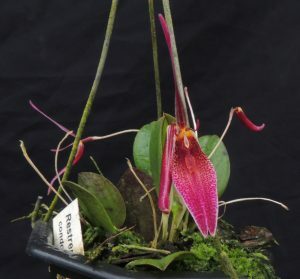 Restrepia condorensis is a small growing species with long thin flowers in a startling pinky-red and a real show stopper. The species is endemic to Ecuador and grows in cool wet forests with the conditions we replicate in our Cool Americas section. We find that the species does well in pots and small baskets where it will turn into a ball or leaves covered in flowers.